Do you ever have those days where you are craving something spicy? I know I do, and today is the day. Spicy food can be healthy food too. 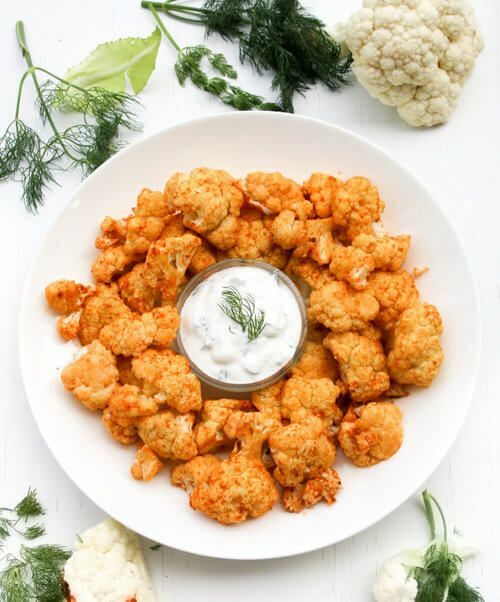 This homemade buffalo cauliflower has a great amount of vitamins and nutrition. Cauliflower, like most vegetables, is healthy for weight loss. It's beneficial for reducing cancer and also detoxifying the body. Hot sauce has some health benefits to it too! It is good for strengthening the heart and relieving headaches. Don't forget to make the simple dipping sauce, that is also low in calories and goes great with buffalo cauliflower. I adapted the buffalo sauce from here. In a saucepan on medium heat, combine 2 Tablespoons hot sauce, 2 Tablespoons unsalted butter, 1 teaspoon white vinegar, 1/8 teaspoon Worcestershire sauce, pinch of salt, 1/4 teaspoon garlic powder, and 1/4 teaspoon cayenne pepper. Let simmer until butter melts. Cut cauliflower into small florets. Mix the cauliflower florets in buffalo sauce and arrange on baking sheet. Roast the cauliflower for 20 minutes. Simple dipping sauce: Combine 4 oz of Greek yogurt, 2 stems chopped dill, and 1 Tablespoon lemon juice.